Createspace Independent Publishing Platform, 9781539165163, 226pp. Master the Interview will save you hours in the interview preparation process, keying you up for the right questions to ask yourself as well as ones that may arise in the interview room. - Kirkus Reviews, "The most trusted voice in book reviews since 1993"
"It's a really terrific and practical book that helps people think about themselves in an organized and disciplined way while prepping for an interview." 3) It does not simply give you one so-called "right" answer to any interview situation or run through a list of potential Q&As, but instead it promotes a nuanced and authentic approach. Part 1 of this workbook covers preparation, from getting the most out of the information and exercises here to cracking the interview code and increasing your interviewing opportunities through networking. Finally, there is a high-level view on how to make a game plan for your interviews. Part 2 presents four different ways of arriving at your value proposition - namely, through a guided workbook exercise, a core competencies review, a discussion of your particular edge and review of each of these in reference to a specific job. While it is important for you to know your value proposition at a deeper level, an interviewer will often appreciate the direct approach. In other words, know your value and be ready to present it, but focus primarily on what problems you can solve for the company or - as they are sometimes referred to colloquially - what employer "pain points" you can address. Part 3 covers interview questions, including the capstone question "Why do you want to work here?" This is a key chapter to read, especially if you are short on time. Part 4 discusses the unwritten rules of interviewing. These chapters are especially helpful if you have a short time to prepare. Part 5 covers interview blocks, confidence boosts and special points in your candidacy that you may want or need to address. It also includes "behind the scenes" factors that may play into an interview and are not always obvious to the job seeker, as well as a final chapter on following up, evaluating offers and negotiating your job package, as well as more technical points such as employee handbooks and noncompetition agreements. Anne Marie Segal is an executive career coach, author and resume writer for attorneys, executives and entrepreneurs. As Founder and Principal of Segal Coaching, Anne Marie has worked with hundreds of professionals across the U.S. and internationally on career transitions, advancement, job interview preparation, leadership development and personal branding through individual coaching, writing, workshops and seminars. She is a frequent public speaker and has been invited to present to the United Nations (ICTY/MICT), Association of Corporate Counsel and National Resume Writers Association, among other organizations. 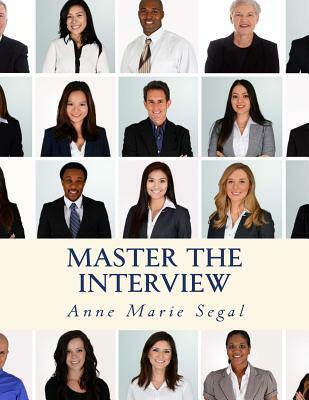 Anne Marie's first book, Master the Interview: A Guide for Working Professionals, was published in October 2016 and is designed as a workbook to help readers grow their networking and interviewing skills and determine their value proposition in the workplace. She is a member of the Forbes Coaches Council, writes on career and resume topics at Forbes.com and has been quoted on CNBC.com and other media outlets. With 15 years of experience as a corporate attorney prior to coaching, including 10 years in the hedge fund and private equity space and more than 4 years at White & Case LLP, an Am Law 100 firm, Anne Marie is a practical, industry-savvy coach and writer. She relishes helping professionals at all levels discern, enhance and communicate their value and unlock advancement in their careers. Admitted to practice law in New York and Connecticut (inactive), Anne Marie holds a J.D. from New York University School of Law, an M.A. in Art History from The University of Chicago and a B.A. in Fine Arts from Loyola University of Chicago. She is also a Certified Career Management Coach (CCMC) and Certified Professional Resume Writer (CPRW). Anne Marie lives and works in Stamford, CT with her husband and two children.